Ask CF: How Do I Dress for a Business-Casual Environment as a Plus-Size Woman? How to look chic at work this summer. Hello, I’ll be interning at a cancer research institution in Houston this summer and need business casual outfit ideas. I know that Houston will be very hot, humid, and rainy, and that the office will be heavily air conditioned. I have a short walk to the lab each morning, I don’t have a lot of professional clothing yet, and I’m plus-size. Do you have any ideas on outfits so that I don’t melt? Thanks! Firstly, congrats on your internship opportunity! It sounds amazing! Secondly, if you’ve already started searching for business-casual clothes for summer, you have probably realized that it can be a bit of a challenge. This is because it’s easier for the line between business-casual and everyday-casual to become blurred, as many retailers seem to think of Summer as vacation time, rather than work time. Thirdly, based on my research for this article, I found that this line is especially blurred in the world of plus-size fashion, where, as I was both surprised and disappointed to find, there isn’t as much available by way of youthful-yet-professional-looking clothing as there is for other sizes. However, don’t be disheartened; just keep scrolling for some suggestions on how to look cute and put-together for work in the summer — no matter what size you happen to wear! 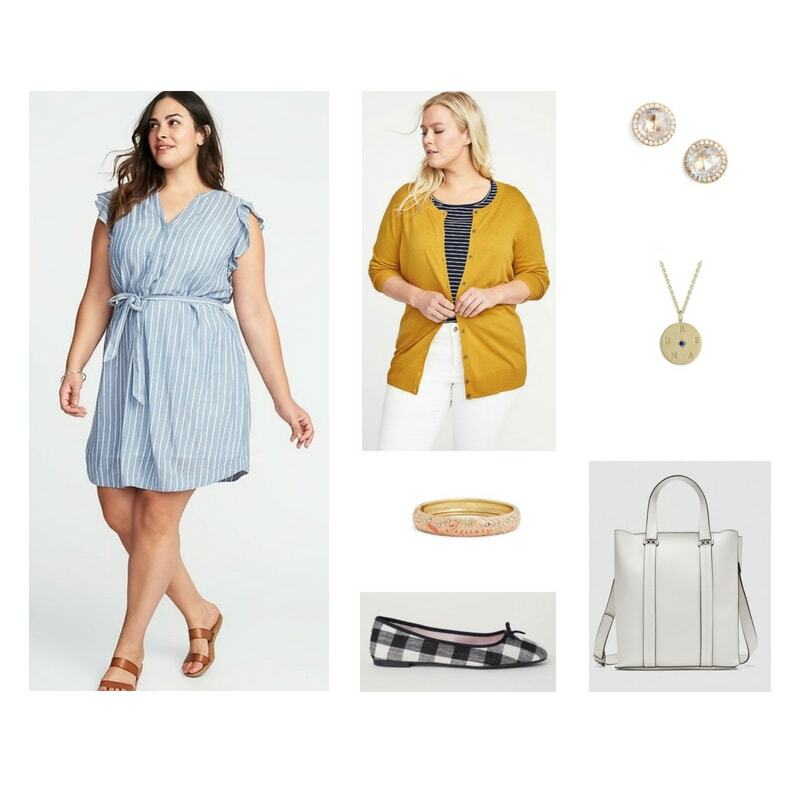 I’ve put together some super cute plus size summer work outfits just for you. Since most labs require closed-toe shoes, add a pair of simple ballet flats; the print on these ones is the perfect way to pay homage to the major moment that gingham is having this season. Now let’s add jewelry. A pink printed bangle adds a third printed element to the look, allowing you to experiment with mixing prints in a fun, yet professional-looking, way. The dress’ v-neckline is perfect for showing off this pretty disc-shaped necklace, while sparkly faux-diamond earrings add a classy touch. Since you mention that the lab will be quite cold, layer on a solid-colored cardigan; finally, a white tote is the perfect warm-weather alternative to black, and is just as wearable, too. For this look, I decided to go with something a little more preppy, but definitely not stuffy! To get it, begin by putting on a breezy white blouse with a banded waist. Next, layer on a flowy striped blazer. Add a pair of brightly colored cropped chinos with a bit more structure to balance out the looseness of the top half of the ensemble. Bolder jewelry, like a chunky chain-link bracelet, adorable lemon earrings, and a triple-strand gold necklace, are in keeping with the outfit’s playfulness, while a nautical-inspired tote is the perfect finishing touch. If you can’t decide whether you’d like to wear something dressier or something more relaxed, why not go with a bit of both? This plus size business casual outfit does just that, combining to the two feels for a balanced vibe. A casual white t-shirt gives this gorgeous and classy wrap skirt a more laid-back look, while the ladylike bows on these patent loafers (which would be great for wearing in rainy weather, by the way!) add a touch of femininity to a traditionally masculine style, making them the perfect addition to this outfit. This cool bright pink blazer proves that dressed-up doesn’t have to equal plain. Meanwhile, a delicate bracelet and necklace allow these statement-making earrings to stand out. Finally, a feminine ruffled bag is the perfect complement to this sophisticated look. As far as footwear goes, these jelly flats are a great option for when you want your shoes to look as good as your outfit does, without having them get wrecked by the water. (Just keep in mind that these ones may not be acceptable for work, since there is a small hole at the toe.) Furthermore, calf-length rain boots are perfect for when something more heavy-duty is needed, but you don’t want to wear full-length rain boots in the warm and humid climate. 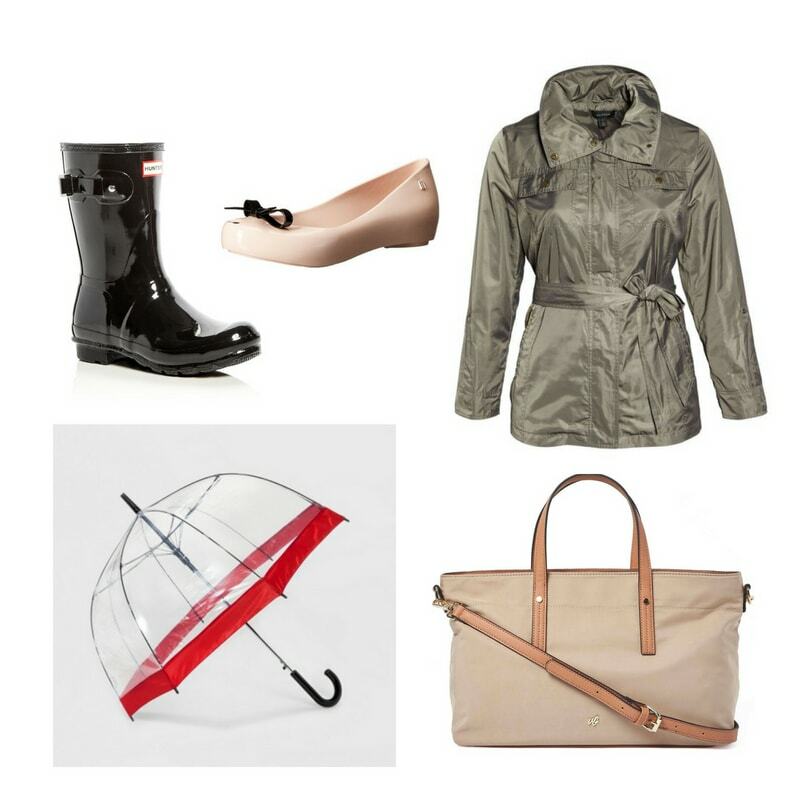 A cute, neutral-colored, lightweight jacket that has a tie at the waist is perfect for wet weather — not to mention that it will go with just about any outfit! A sturdy nylon tote will keep all of your essentials dry; lastly, you can’t go wrong with a classic transparent umbrella; I love the red stripe that goes around this one! I hope that these looks have been helpful in providing you with stylish, yet practical, outfit ideas for your internship. Good luck, and thanks for your question! Do you have a fashion question? Send it to us! 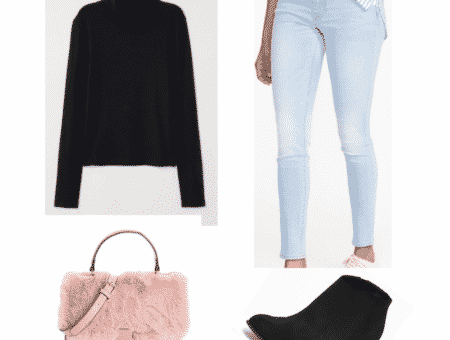 Is there something in your closet that you want to wear but have no idea how to style? 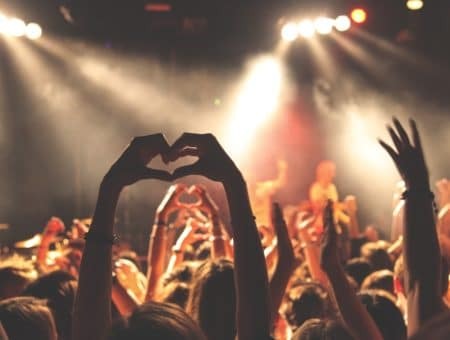 Do you need advice on what to wear to an upcoming event? Do you have a specific fashion conundrum? If you have a fashion-related question that you would like to see answered in this column, simply email it to askcf @ collegefashion.net, and one day you might see your question answered right here on the site! 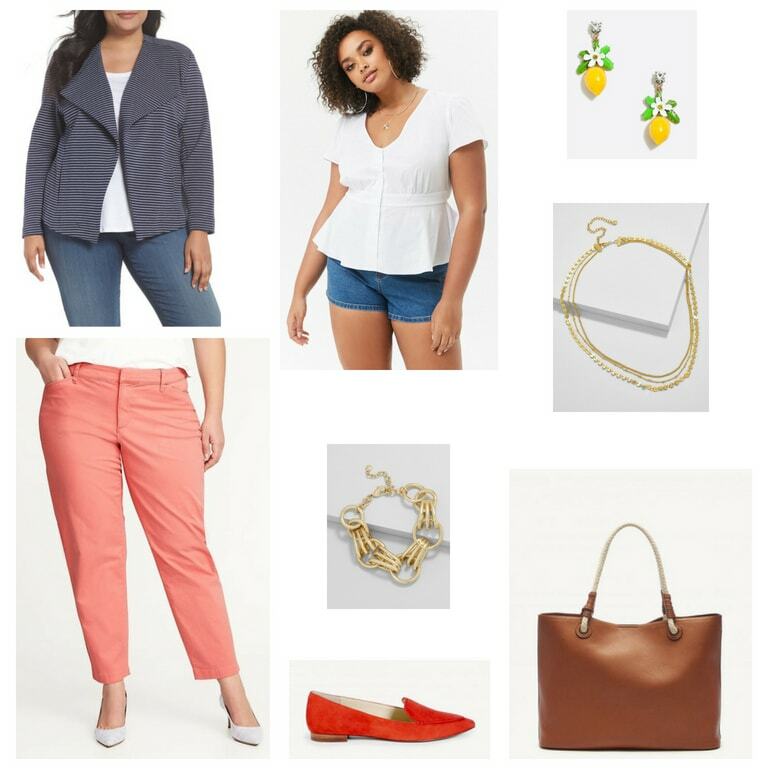 Do you have any tips for dressing for business-casual dress codes in the summer as a plus size woman? What about dressing for hot, humid, and rainy days? Do you have any favorite shopping destinations for business-casual plus-size clothing?